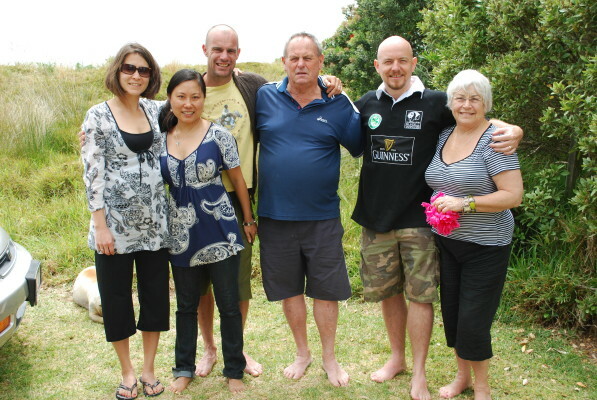 On Christmas Eve we took a leisurely stroll into downtown Hamilton for brunch and to do a little last minute Christmas shopping and also to kill time until Lily finished work so we could caravan up to Waihi Beach to spend Christmas with the MacDonald Clan. We had an incredible greeting when we arrived with lots of hugs and kisses when we arrived. It was such a warm greeting and it helped us feel right at home. 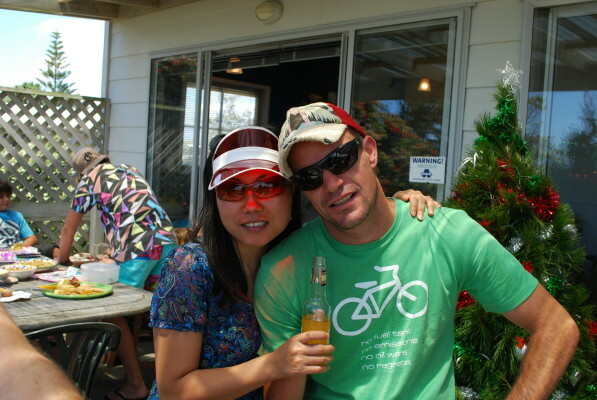 Mark's parents rented a beach house to get the entire family together for Christmas. Mark is the youngest of 5 and we had the pleasure of spending the holidays with his parents, 3 brothers, 1 sister, their partners, 1 cousin and 14 nieces and nephews. Needless to say Gemma and Angus were so happy to have such a large group of kids to spend Christmas with. 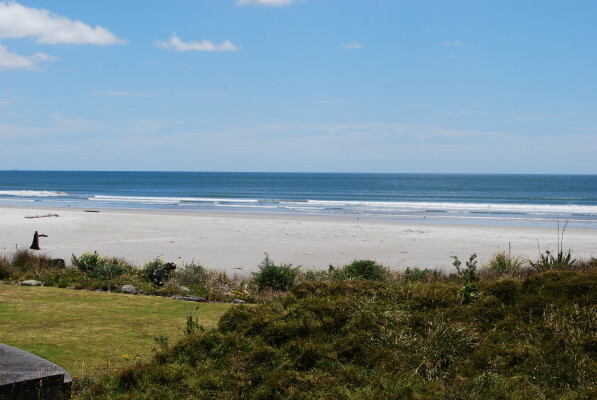 A view of Waihi beach from the house where we spent Christmas. 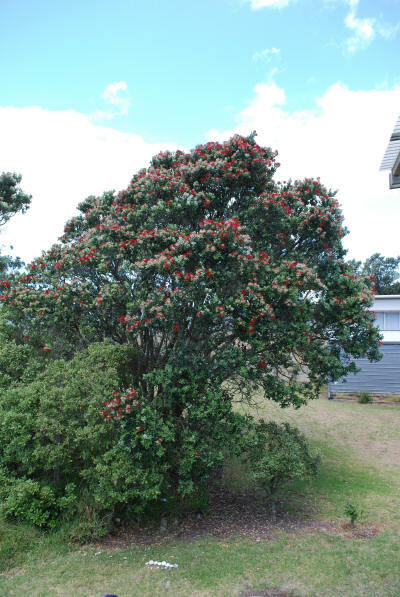 The New Zealand Christmas tree, the Pohutukawa tree. These trees live along the coastline and they have gorgeous red flowers. 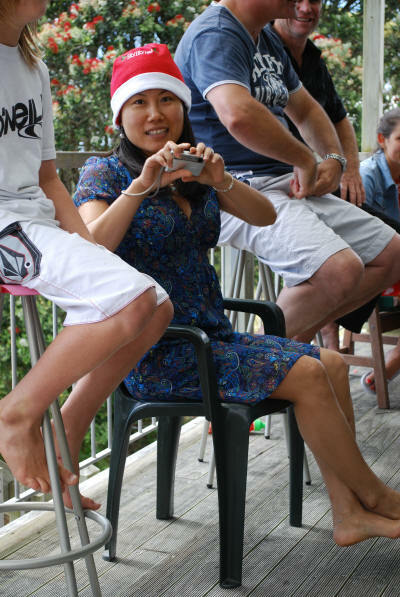 On Christmas Day morning I did my best to help Mark's family prepare the Christmas feast. When I was trying to come up with things to add to their Christmas menu it was a bit difficult since I was so used to making Christmas dinner in a cold climate I was trying to think of things that were a bit more beachy and bbqy. I helped out with a few of my recipes which included my bruchetta, guacamole, and potato salad which I think by the warm reception turned out well. Dinner was absolutely amazing! We had cold leg of lamb that was raised by the MacDonald family, the best smoked ham I have ever tasted, white bait fritters, chicken mignon, boiled potatoes, green bean salad, and glazed carrots. 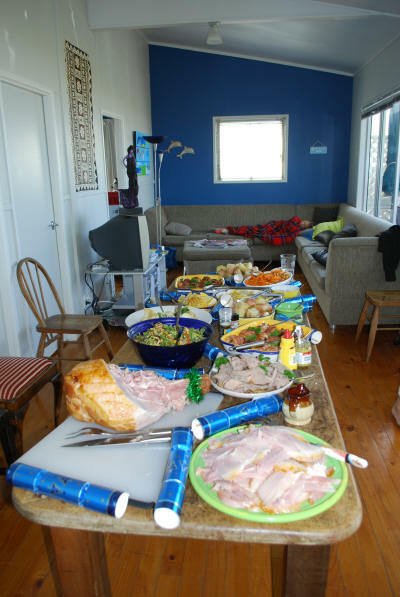 Our New Zealand Christmas Buffet! After I ate more than my fair share of food I took Angus for a little nap because he was over tired from playing so hard and not in the best of moods. I fell asleep with him for 2 hours and it was the best little post Christmas dinner nap I have ever had! We were happy to see dessert was on the table and that we didn't miss out on our Christmas sweets. 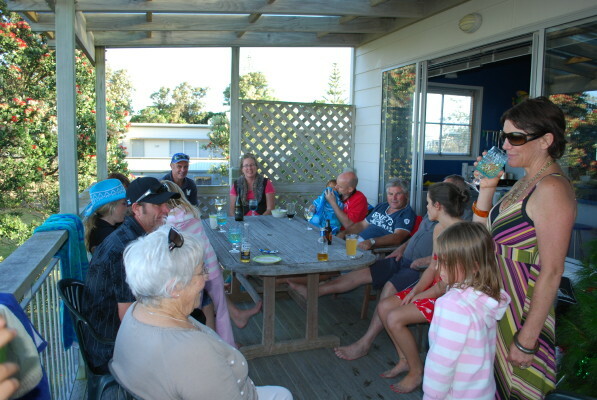 The MacDonald clan having drinks on the deck! That is my kind of Christmas! 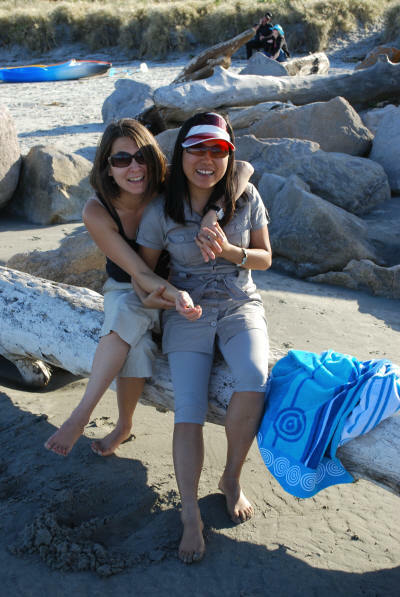 Lily and me enjoying the beach. The great thing about NZ in the summer is that it stays dark really late. 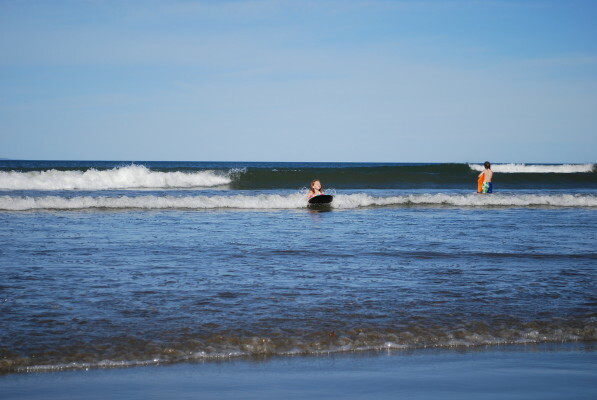 The kids went to the beach in the early evening to do some boogie boarding and Gemma really loved it! She really took to the sea water last Christmas and she keeps getting more and more daring. 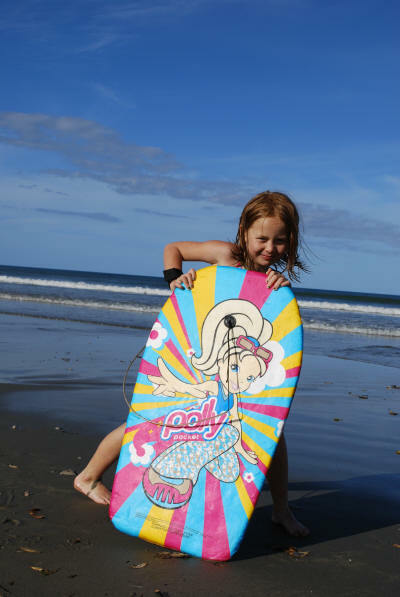 Here are a few shots of her with the board. Gemma made a ton of friends on our two days at the beach. 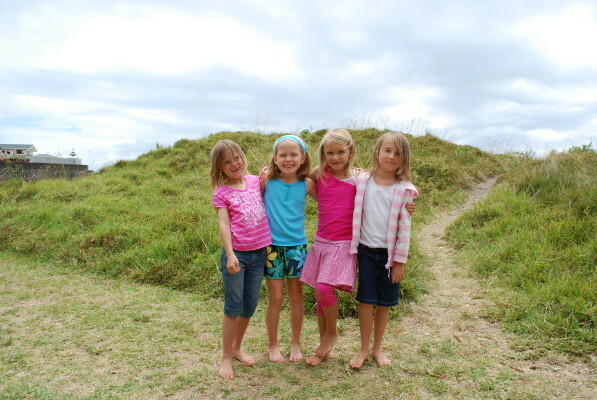 Here are her with her new friends Paige, Skye and Brie. Us with the MacDonalds! We are looking forward to hosting them all in Chengdu in the very near future!!! 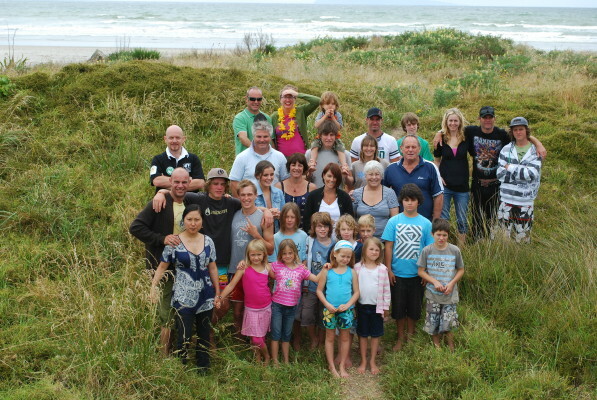 The entire Christmas Clan. What a fabulous Christmas we had and what welcoming hosts!! !